My adventure in purchasing and implementing the Robix Rascal robotic arm kit in a developmental disabilities workshop/educational setting. This blog was started simply to provide firsthand information to anyone interested in the Robix Rascal robotic arm kit from Robix.com. When I was getting started, I had trouble finding any such information and decided to start this blog as a resource for others. Please feel free to contact me with any questions or comments. I'm moving along quite well in my effort to control the Robix Rascal using just a microcontroller-based device. I decided to go from 21 available program steps to 20. I used the extra EEPROM locations to store the rest position for the robot. That way, I can set the robot to what I want the rest position to be, then program it into the system so the next time I power up, the rest position will still be there along with the rest of the robot program. My device is actually working very well and I'm surprised what the robot can accomplish in 20 steps or less. Programming works much as it does with the USBOR and laptop: I use the buttons on my programming interface to move the robot to each desired position, then press the "store" button to load that position into the EEPROM. When I run the program, each set of motor positions is read in sequence from the EEPROM and the robot moves from one to the other just as with the software provided by Robix. As soon as I have everything constructed and finalized, I'll post my schematics, microcontroller program, pictures and videos. It's going to be so nice to just grab Murray (the robot), my device, and a power supply and be able to quickly move him anywhere and get him set up quickly. Just a quick update. My endeavor to move control of the Rascal from a laptop and an USBOR to a microcontroller chip is going great! I'm using a PIC16F628A which only has one PWM output pin; so, I have written my own routine to continually update all of the motors with ongoing PWM on six different pins to six different motors while the program is running. I'll be honest, so far this project is working out far better than I even expected. I'm using the chip's on-board EEPROM to store the robot program steps to allow for program retention even when power is turned off. Since I have six motors, using the EEPROM only allows for a program of up to 21 steps (128 locations divided by six motors), but that is more than enough for most of what I use the Rascal for here at work. That is also more than enough steps for a good demo. Once I get everything finalized, I can always hook up an outboard serial EEPROM chip to increase the steps to thousands. But, for right now, I'm keeping things quick and simple. A few days ago, I thought of a great result from this project: When all is done and working properly, I'll be able to free Murray (my Rascal's name) from ALL tethers except those going to the motors themselves. That will mean NO computer and NO USBOR! In fact, I could even put together a D-Cell battery pack and run the robot without even having to plug anything into an AC wall socket! I will literally be able to grab the robot, the little controller box and the battery pack and go wherever I want with it. I PROMISE that when this project is finished and working, I WILL post my firmware, my electronic schematics, some pictures and maybe a video or two so others can continue from where I leave off. This is so much fun! Sometimes I can't believe I get paid to help people by doing something I love! Work has slowed down a bit around here, and as I usually do, I am taking advantage of the slowdown to continue advancing my various Robix Rascal projects. Although I haven't completed my acoustic interface, and haven't given up on it either, I have temporarily moved on to a new project which will be of more immediate use. I will return to the acoustic interface at a later date. I was out on the workshop floor the other day while folks with various disabilities were working hard on the various jobs for which they are paid. I noticed a quadriplegic gentleman sitting there watching everyone else work. Because the job involved packing light parts into a small box to be shipped to retail stores, there was no way for him to participate. This particular man uses some of my various computer interfaces to do work on the computer, but when there are no computer jobs on the schedule, there aren't many other options for him. As I walked by and saw him sitting there with the desire to work, but without the means to do so, I realized that Murray (my Robix Rascal) could easily put those parts into that box. I can't be without my laptop here at work, so I can't put it out on the floor to operate Murray. Besides which, that wouldn't be a very safe place for the laptop. I came to the conclusion that there needs to be an inexpensive way for me to quickly program Murray for a simple, repetitive task without him needing to be tethered to a laptop computer. I envisioned a small device containing control circuitry for Murray, and a jack into which to plug a single switch to initiate a program. I would load into the device a program of steps for Murray to follow, then each time the switch plugged into the jack were pressed, Murray would follow the steps then return to his rest position until the next switch press. Thus, each time a box was ready to be packed with parts, the quadriplegic gentleman, or anyone else for that matter, would need only press the switch on his wheelchair to start the program and have Murray pack the box. I want to make the programming interface separate so I can plug it into my controller box, program Murray, then unplug it so no one else can interfere with the programming. the 16F84A is rather outdated and lacks the power I will need for this project, so I'm biting the bullet and getting some 16F628A microcontrollers which I will teach myself to use, then utilize them in my design. I 've been continually thinking about, and occasionally actually working on, finding a good way to create a simple interface so that folks who are quadriplegic can operate the robotic arm without assistance using only a single button they can press with their head. I came up with a pretty unique solution that seems to be working reasonably well. I created a simple program using GameMaker that outputs specific tones when a button on the GUI is clicked. I used Goldwave to create the tones and save them as WAV files. I then used the various WAV files to create sound objects in the GameMaker program. I created tones from 500HZ to 10KHZ in 500HZ increments. I have the program set up to depict 6 servo motors with two directions for each (CW and CCW). The program slowly scans through the various motors and their two possible directions until the user presses the switch on his wheelchair which is wired into the left click button on a mouse modified as described in an earlier blog entry. When the button is pressed, whichever motor and direction was highlighted at that instant determines which of the tones is sent out via the sound card/headphone jack. I decided to use square wave tones via the headphone jack as my interface to the robot since most of the specialty computers mounted to the wheelchairs of persons with developmental disabilities already have most, if not all, of the USB ports taken up. Besides, the circuitry needed to interface to a USB port was a bit more involved than I cared to undertake. I used a PIC16F84A to receive the tone, determine which tone it is receiving, and output an appropriate pulse width modulation signal to move the appropriate motor in the desired direction until the user releases the button. I know that the 16F84A is an outdated chip, but I happen to have a few of them laying around and, since money is tight around here, I decided to use those up first before trying to buy newer chips for my inventory of parts. The arrangement provides reasonable precision for what I'm doing, but is noticeably less repeatable than when using the USBOR that came with the robot. One of the advantages to this audio tone approach is that I can create a "program" of sequences for the robot to follow by simply creating an MP3 file of the collections of tones. Once such a "program" is created, I can remove the robot from the computer completely, and run the program by playing an MP3 player into the input pin of the microcontroller chip. My next challenge is to create a stand-alone, microcontroller-based tone generator so that the robot can be controlled directly without the need for any computer at all. After that, I'll come up with a way for the controller to store the sequences of tones so that a program of robot movements can be created, saved then run as desired. As soon as my prototyping and experimenting are done to the point that I have circuitry, firmware and software that are good enough, I'll post them here for others to experiment with. When I have everything the way I want it, I'll have a small, portable means of directly controlling the robotic arm with no laptop, or other computer, necessary. I have been away from my Robix Rascal project for quite a while (too long) due to being pulled off to work on other projects. I'm now trying to find ways to access the Rascal using a laptop and self-written software. I am a science teacher and electronics technician, not a programmer, but I still manage to do some very simple programming using GameMaker and Visual Basic.Net. I'm hoping to find a way to access the Rascal's control software via it's .dll file in order to send commands to the robot using my own software. Like I said, though, my programming skills are very rudimentary so I am struggling somewhat trying to teach myself enough programming to be able to implement my own software interface to the Rascal. I have been searching the Internet for months trying to find examples that might help me. The only one I can find is the example VB program that comes on the Robix software disk. Unfortunately, the example VB program from Robix sends commands to the Rascal via a VB.Net console instead of a Windows Application GUI. What I want to do is create a standard Windows Application GUI with a virtual button that can be clicked to send a command to the Rascal. If I can find a VB example that sends even a single command to the Rascal via the click of a virtual button, I can expand upon that example to create the software I'm attempting to write for myself. I want to send commands to the Rascal using my own software so that I can tailor the software to the specific needs of the physically challenged persons who will be using it. I would eventually like to have a Windows GUI scan through choices of clickable buttons and have the person in the wheelchair press the switch on their wheelchair to click the currently selected button and move the Rascal in the indicated direction as long as the button is held down. Such an interface would allow wheelchair-bound persons with severe physical limitations to control the Rascal directly without any assistance. I can hardly wait to see a quadriplegic person who has been stuck in a wheelchair their entire lives be able to actually pick up small manipulatives and move them around. As I have already mentioned, I use a very long wire from the switch on the wheelchair so that the physically challenged person operating the robot is at a very safe distance. If you attempt any of what I am doing, make sure the operator is at a safe distance and is wearing a pair of approved safety goggles. The Rascal came with small plastic balls as manipulatives. I have added to my set Q-tips, cotton balls, 1" lengths of 5/8" PVC pipe, various sizes of rubber O-rings and 1/2" wooden cubes. I keep all of my manipulatives small and light in order to reduce the chances of injury to humans or robots. I will consider my self-made software adequate when one of our quadriplegic persons is able to use it to pick up and stack the wooden cubes without assistance. As soon as I come up with something adequate and practical, I will post it here. If anyone would be willing to donate time and effort to help me with the software aspect of this project, please contact me. I have found that getting all of the manipulatives (the things for the Rascal to pick up and manipulate) set up from one trial to the next is very difficult. 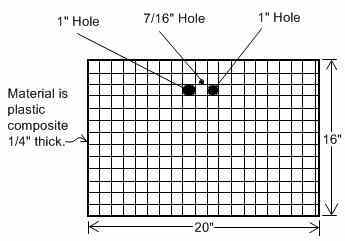 If the manipulatives are not in the exact same location and orientation each time, the Rascal cannot manipulate them with much accuracy or repeatability. This of course was no surprise to me, but it did prove to be a bigger problem than I had anticipated. I tried putting pieces of masking tape on the table top and labeling them as to which manipulative would be placed there. This worked fairly well until I had to move the Rascal from one location to another. I needed to come up with a way to standardize the placement of the manipulatives for the robot regardless of when and where I moved it. I solved the problem by making a very simple "desk top" for the robot. The desk is simply a 1/4 inch thick piece of composite plastic board which I can set on top of whatever surface I am placing the robotic arm. The plastic board was just something I had laying around, so I'm not sure where such material could be found. I would think a trip to the hardware store or Home Depot might net some results. I'm not sure if anyone makes them, but a 1/4" thick plastic cutting board might work as well. I would think that sufficiently flat, 1/4" plywood could also be used as long as the plywood didn't end up warping over time. Any warping in the desk could just about render it useless, so I'm sticking with the plastic and I don't really recommend trying it with plywood. The desk is 16 by 20 inches and, using a metal yardstick and a utility knife, I created vertical and horizontal lines at 1 inch intervals. Using an electric engraver, I labeled the vertical lines with letters of the alphabet and the horizontal lines with numbers. I drilled 1 inch and 7/16 inch holes in the board to accommodate the two front rubber feet on the bottom of the robot along with the bolt that holds the pivot assembly in place. I positioned the holes so that the metal weight along the bottom of the robot base rests tightly against the edge of the desk. In other words, the back two rubber feet of the robot are actually on the table and the front two are dropped into the 1 inch holes. I then push down lightly on the robot's base to make sure those two front feet are snuggly seated. In making the desk, it is imperative that the robot fit snuggly in the holes and tightly against the edge of the desk. That is what assures that the robot is in the exact same position each time it is set up. To make sure I got the hole placements perfect, I first made a paper, then cardboard pattern which I then transferred to the desk material after everything was right. I think I had to make two or three patterns until I got it perfect. Lastly, I used the tip of a 3/8" drill bit to make a couple of dimples in the desk's surface to act as permanent wells to hold the little wooden balls that come with the Rascal kit. When I write a script of commands for the robot, I include a comments section into which I type the number/letter coordinates of where each manipulative goes. That way all I have to do is load the script, read the comments, and place all of the manipulatives accordingly. I have found that this desk method works very well. If I take the robot somewhere for a demonstration or to perform an actual work task, it runs the scripts successfully every time provided I get the location for each manipulative right. As long as the robot's configuration utilizes the base that comes with the Rascal kit, I can build the robot into various configurations and still use the desk to place manipulatives consistently. With practice, I am getting very adept at programming the Rascal robotic arm. The person I am currently working with is confined to a wheelchair and can only use his head to press a switch attached to his headrest. I bought an inexpensive, optical mouse at Radio Shack and drilled a 1/4" hole into the case at the end farthest from the mouse buttons. In the hole, I mounted a 1/8" phone jack also purchased from Radio Shack. Using very thin wires, I paralleled the jack with the left click button inside the mouse. With the switch on the man's wheelchair plugged into the jack on the mouse, he can perform a left click by using his head to push the button on his headrest. After using the Nexus software to write a script for the Rascal, I set the mouse cursor on the green 'run from top' arrow at the top of the software window. Now, when the man presses the switch on the headrest of his wheelchair, he is essentially clicking on that 'run' arrow and starting the script thus making the Rascal run the commands in the script. For safety, I use a very long wire so that the operator is across the room from the robot. I'm amazed at how quickly students can learn the basics of robotics and understand the simple programming used by the Robix Rascal. I'm hoping to eventually come up with a way for people with severe physical limitations to program and control the robotic arm without any physical help. It would be a real thrill to see such students able to write a simple script and then run it for themselves. I assembled my Rascal in the "chemist" configuration provided in the instructions which came on a CD along with the Rascal. It was the first time assembling, and this is one of the more complicated configurations, yet it still took me less than an hour to get it assembled. After some practice, I can do it in 20 minutes or so now. All of the tools needed for assembly and dis-assembly come with the kit--nice! Within about 45 minutes, I had the Rascal doing some fairly complex movements and performing some useful tasks. One such task was having the Rascal clean up its own manipulatives (work pieces) and placing them back in the box. Once you get used to the "teach pendent" in the software, creating a script of commands for the Rascal to follow is surprisingly fast and easy. Now I just have to find a way to let someone in a wheelchair safely and effectively operate the Rascal robotic arm. So far, this is so much fun that I can't believe I'm getting paid to do it! The Rascal kit arrived today. It came in a very durable tool box. Several times, while waiting for the Rascal to arrive, I have watched the instructional videos available on the Robix.com web site. The first thing I noticed when my Rascal kit arrived, is that the base and pivot arm assembly are very different from the ones appearing in the instructional videos. I spent several hours searching the Robix web site and the Internet for information on how to properly assemble these new parts. I found nothing--even on the Robix site. Assembly of all of the other parts are covered quite well in the videos, but absolutely nothing on the new base and pivot arm assembly. I guessed as best I could and managed to get the servo motor mounted to the pivot arm and the pivot arm mounted on the base. Although it did seem to work, the assembly seemed a bit flimsy and I didn't quite trust it. I decided to email the Robix company and see if they could offer any help. I was hesitant because I figured I would get either no response, or have to wait weeks for it. Much to my surprise, I received a response within 24 hours! As a matter of fact, any time I have had to email Robix for help, I got a response within 24 hours. So far, I am very impressed with the customer service. It turned out that I had most of it right, but there was a hidden screw in the middle of the pivot arm that locks down the servo motor. Robix sent me an explanation of how to do the assembly, as well as drawings of the pivot arm. If I didn't ask, I'm not sure how long it would have taken me to discover that hidden screw--assuming I ever did. I emailed again asking why they didn't update their documentation. I am a science teacher and a technician and I had trouble figuring it out--I wonder what other, less technologically inclined customers did to figure out how to assemble that pivot arm. I was told that "in the spirit of education and experimentation," the documentation was incomplete so that people could learn as they figured it out for themselves. I don't see how that can be the case considering that every other component of the system is thoroughly addressed in the instructional video, including the old version of the base and pivot arm assembly. If they wanted people to have to figure it out for themselves, then they should have provided no instructions on any of the parts instead of just leaving out instructions on one of the most critical parts. Besides, Robix seems to be very safety-minded when it comes to robotics. Their literature and their web site is filled with tips, suggestions and warnings. Had I used my original assembly (before getting instructions and finding out about that hidden screw), the robotic arm would have eventually come completely loose at the first joint which could have made for a rather dangerous situation depending upon what the robot was doing at the moment it came apart. I am very grateful to the Robix company for providing the information so quickly and helping me to get up and running. That pivot arm glitch aside, I am very impressed with the Rascal kit and with the customer service I have received so far. When it comes to technology, I am not very easily pleased, but I am very satisfied with the Rascal robotic arm kit. Honestly, for the price, this is the buy of the century! Now I have to figure out how to use the software and controller that comes with the Rascal kit. 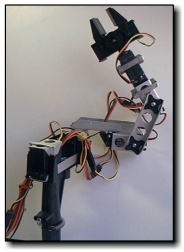 After much research, I have settled on the Rascal robotic arm kit from Robix.com. I decided on the Rascal because of its price, simplicity, the fact that I could only find good reviews about it on the Internet, and I was impressed seeing the Rascal making coffee and throwing ping pong balls in videos available on the Robix.com web site. My employer approved the project and the Rascal has been ordered. I decided to create this blog because there just were not enough reviews and ideas on the Net from people who had purchased a Rascal kit. I decided to help fill this void by adding my own blog to let others see how the Rascal works out in my application. The Rascal robotic arm kit cost me $558.00 including shipping. Since it comes as a kit with extra parts, it should be easily reconfigured and adapted to different tasks. I anxiously await its arrival. I work in a sheltered workshop for people with developmental disabilities. By job is to design, construct and implement adaptive equipment and devices which help persons with physical and mental disabilities to work, play and participate in daily activities. We have such a large variety of jobs and activities available that building a separate device for each is not practical. In our program, that could run into hundreds of separate devices. I need a device that is adaptable, reconfigurable and dexterous so it can be utilized by a lot of different people and can perform a wide variety of tasks. My task at the moment is to make such a device accessible to persons who are confined to wheelchairs and are unable to use their arms and/or legs efficiently. Many such persons in our program are able to use their hands or heads to operate a simple push button switch mounted on their wheelchair. I have decided that a simple, small, low torque robotic arm would be the way to go. I will submit the idea to my employer for approval. Contact me | Home | Robix.com.